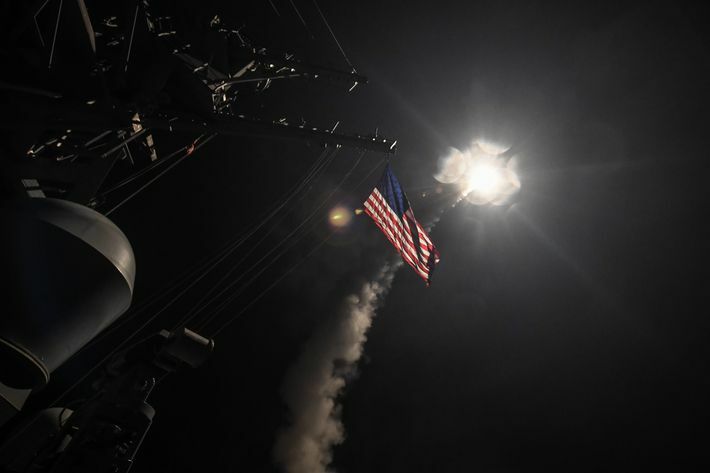 The USS Porter fires a Tomahawk land attack missile at a Syrian airfield on April 7, 2017. The United States attacked a Syrian air base on Thursday night in response to the government’s chemical attack on civilians in Idlib Province earlier this week. This is the first time the U.S. has taken direct military action against Syria during the country’s six-year civil war. 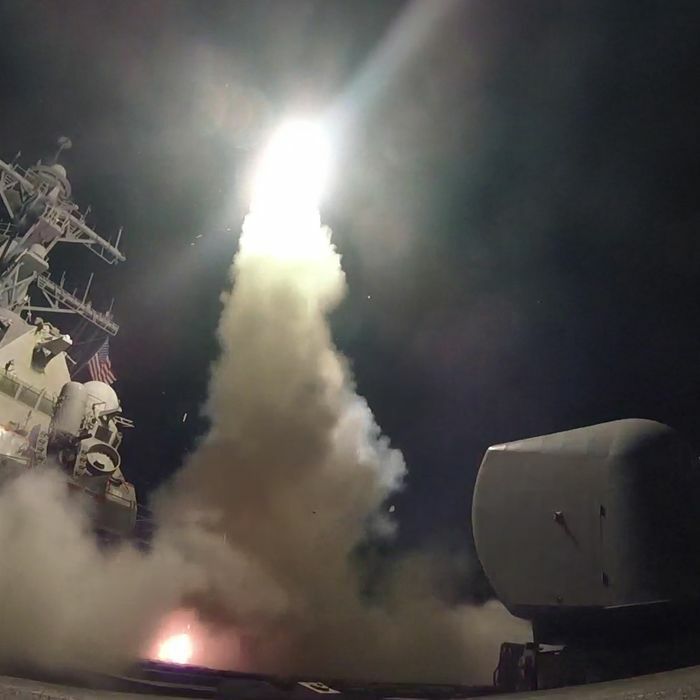 Two U.S. warships — the USS Ross and USS Porter — fired 59 Tomahawk cruise missiles at the Al Shayrat airfield in Homs Province in western Syria. That’s believed to be the site from which Syrian President Bashar al-Assad’s forces launched the chemical attack that killed at least 100 people on Tuesday. The strike began around 4:40 a.m. local time (8:40 p.m. ET) and lasted for three or four minutes. The strike targeted hardened aircraft shelters, petroleum and logistical storage, ammunition supply bunkers, air defense systems, and radars. The U.S. military avoided hitting a suspected sarin gas storage facility because they feared it would disperse the deadly gas. Of the 59 cruise missiles fired, all hit their targets except for one, a source told the AP. The Kremlin disputed this, estimating that less than half — about 23 cruise missiles — hit their targets. Military planners tried to “minimize risk to Russian or Syrian personnel located at the airfield,” according to Davis. U.S. forces avoided hitting the Russian military area at the airfield, and they believe no Russian planes were present during the attack. Nine people were killed, including four children, according to Syrian state TV. The victims were reportedly from al-Shayrat and al-Hamrat villages, which are close to the base. The attack puts the hundreds of U.S. troops already stationed in Syria to assist in the fight against ISIS at greater risk. The U.S. launched air strikes in Syria in September 2014 as part of the coalition campaign against the terrorist group, but Syrian government forces were not targeted in those attacks. Here’s exactly what the president said about the strike. President Trump is at Mar-a-Lago for his meeting with Chinese president Xi Jinping. McMaster, Tillerson, and Defense Secretary James Mattis are with Trump at his Florida resort. Vice-President Mike Pence was at the White House on Thursday evening. In 2013, Trump tweeted more than 20 times that President Obama should not attack Syria in response to Assad killing 1,400 of his people with sarin and VX gas. Though Assad crossed Obama’s “red line” by using chemical weapons, the president sought authorization from Congress to use military force against the regime. It appeared Obama did not have the support of Congress, but before a vote was taken a diplomatic solution emerged, with Syria promising to destroy its stockpile of chemical weapons. White House Press Secretary Sean Spicer characterized the president’s decision as a “72-hour evolution.” Planning for a military response began in earnest just after Trump adviser Steve Bannon was booted from the National Security Council on Wednesday, a possible hint of Bannon’s waning influence. That same day, military aides presented Trump with three options for responding to Syria’s use of chemical weapons. The Intercept reported that one option involved a “saturation strike,” launching dozens of cruise missiles “in an effort to limit future Syrian Air Force attacks on rebel positions.” This involved attacks on Russian air defense systems used by the Syrians, which would have killed Russians. That would have been a drastic shift in U.S. policy, and there’s no word on how Trump responded. According to the New York Times, he told his aides to focus on two of the proposals. Trump arrived at Mar-a-Lago Thursday afternoon, and huddled for a “meeting of considerable length” with his top national security aides. Some, including McMaster and Mattis accompanied Trump to his Florida resort; others, including Vice-President Pence, were looped in via video-conference from Washington, says Bloomberg. Trump ultimately decided to launch a far more limited strike at around 4 p.m., and then met with and dined with President Xi, where he informed the Chinese leader of the strike. Members of Congress generally supported the strike. According to Bloomberg, the White House began quietly informing lawmakers of a possible plan to use force in Syria before Trump took his trip down to Mar-a-Lago, but before the administration finalized its strategy. The White House began official outreach to individual Congress members after the attack had been launched, reports CNN. But, as in 2013, lawmakers have broken into several bipartisan factions. A White House official said more than two dozen Republican and Democratic members of Congress were briefed prior to the strike, but Trump did not seek formal congressional authorization. Liberal Democrats like Senator Brian Schatz and Representative Ted Lieu joined with libertarian-leaning Republican Senators Rand Paul and Mike Lee in condemning Trump’s decision not to seek congressional approval. Trump sent US ground troops to Syria last month purportedly to fight ISIS. Now our troops are at risk of being attacked by #Assad forces. Congressional leaders from both parties took the middle ground, applauding Thursday’s strike while suggesting that they should be consulted before further action is taken. The attack “significantly increases” the risk of a direct U.S. confrontation with Russia, Kremlin spokesman Dmitry Peskov said. Russia is backing Assad with the help of Iran. Putin believes the U.S. attack is an “aggression against a sovereign state in violation of international law,” according to spokesman Peskov. He also said the strikes were carried out under a “far-fetched pretext.” Russia claims that the civilian deaths on Tuesday were the result of Syrian forces hitting a rebel chemical arsenal. A statement from the Kremlin added that the U.S. committed the strike as “an attempt to distract from the mounting civilian casualties in Iraq,” an apparent reference to the Mosul bombing that killed as many as 200. The Pentagon was unclear about the immediate consequence of Russia’s decision to cast aside the agreement. A Russian Defense Ministry spokesman, Mayor General Igor Konashenkov, said that Moscow would help shore up the most “sensitive Syrian infrastructure,” another clear sign that Russia is refusing to distance itself from Assad. Tillerson is set to travel to Moscow next week to meet with Russian officials. Alaa Alyousef, a 27-year-old resident of Khan Shaykhun who lost at least 25 relatives in the chemical attack, said the U.S. strike “alleviates a small part of our sufferings,” but he’s worried it’s only a face-saving measure. 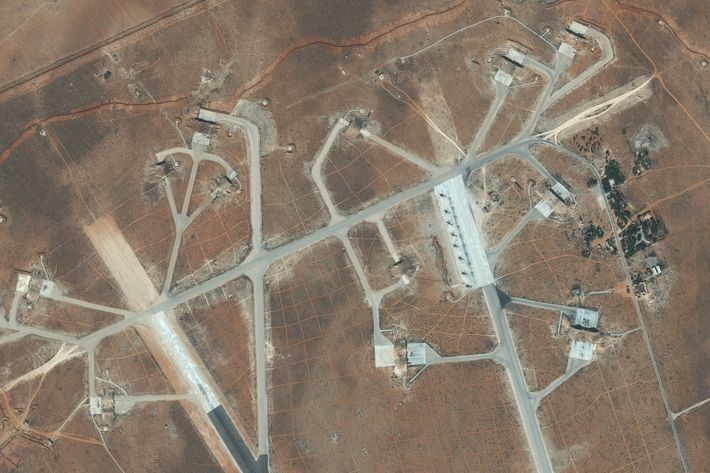 “What good is a strike on Shayrat air base alone while we have more than 15 other air bases,” he said. The United States’ allies have been mostly supportive of U.S. action, particularly the United Kingdom, Australia, and Israel. Less than 24 hours after the strike, aircraft – either Syrian or Russian warplanes – took off from bombed-out airfield for a mission near Palmyra, reports the AFP. Syrian or Russian aircraft have carried out strikes on at least eight towns since the U.S. intervention, including airstrikes Friday and Saturday on the same town, Khan Sheikhoun, which was struck with chemical weapons on Tuesday. “It does demonstrate that President Trump is willing to act when governments and actors cross the line … and cross the line in the most heinous of ways,” he added. A senior administration official told CNN that the president’s strike should not be viewed as a full-on campaign to remove Assad from power, and that defeating ISIS remains Trump’s top priority. The official described the strike as a response to the “unacceptability” of the Syrian strongman’s use of chemical weapons. Senior Pentagon officials are reportedly investigating whether Russia participated in any way in the apparent chemical attack in Syria on Tuesday. The Associated Press reports that a drone was spotted near the site of the chemical attack in Idlib province earlier that day; it is unclear if it belonged to Russian or Syrian forces.